The folks down at the little church did spot the nest and put a few stakes up to alert people that the killdeer’s nest was there. 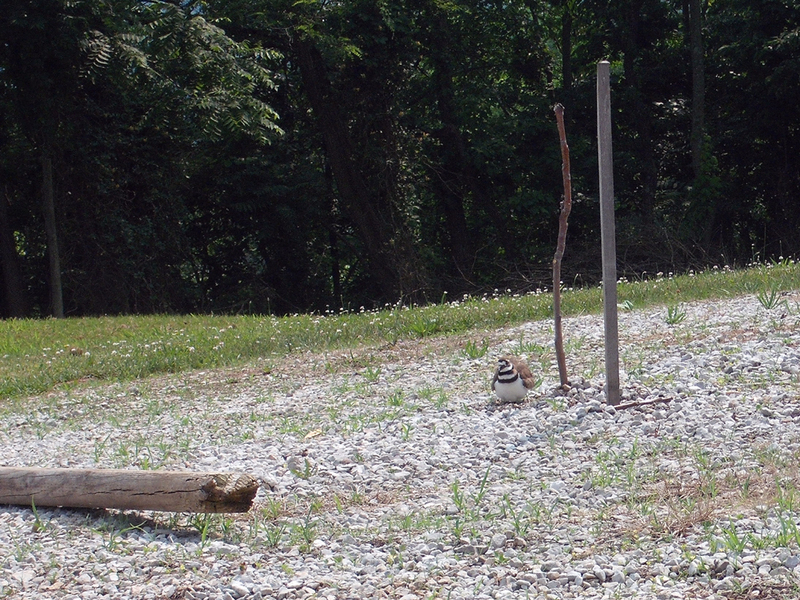 Mama killdeer wasn’t bothered by the new objects and is still faithfully sitting on her nest. As I understand it, she will relocate her babies once they hatch. That would be a good idea. We have a lot of barn cats around here. We found a killdeer’s nest while we were out for a stroll this evening in the parking lot of the little church at the end of our road. I’ve seen killdeer before and usually see a lot of them in the Walmart parking lot of all places, but I’ve never seen their nest before. The bird will try to decoy you away from her nest when you first come upon her. She fanned her wings out low and ran a few feet away making a high-pitched “eee-eee-eee-eee-eee” call, trying to get us to follow her away from the nest. As we came closer, she flew away. Ava’s got a thing for birds right now and is always trying to catch them. The eggs were really well camouflaged and blended in well with the gravel. She laid them right in the middle of the gravel, not off the side in the brush like you think she would. 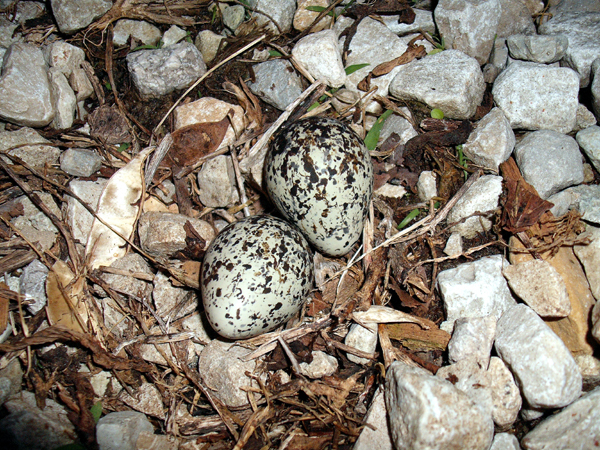 The nest is sparsely lined with leafy debris, not so soft and comfy like most bird’s nests. The eggs are also much bigger than I would have expected for such a small bird, about the size of a ping-pong ball. I am afraid someone will run over the nest when people arrive for church tomorrow. I thought to try to put some bricks around the nest or a sign or something, but after I thought on it for a bit I figure the killdeer will be put off by that and may be more likely to abandon her nest if I “blow her cover”. So I only came back to take a picture of the pretty eggs. I hope they’ll make it! They were in a section of the parking lot that sees less traffic, so maybe they’ll be ok.